Mireles leads the outdoor music class activity. On a warm fall day, a group of young men and women casually gathered near the Quad on the St. Mary’s University campus and began playing impromptu beats on a variety of percussion instruments. They soon drew a crowd. 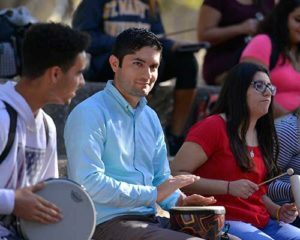 As more students approached, Matthew Mireles handed out instruments, inviting them into the drum circle. It wasn’t a traditional college class, but it was just the kind of unconventional lesson Mireles likes to teach. With his youthful looks and infectious energy, it might be easy to mistake Mireles for a St. Mary’s student — and, not so long ago, he was. 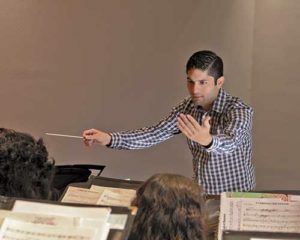 A 2007 St. Mary’s graduate, he went on to earn his doctorate in Music and returned in fall 2016 as Assistant Professor of Music and Director of Bands. A nationally recognized euphonium player who has recorded two albums, Mireles comes from a long line of St. Mary’s alumni, which included his father, the late Honorable Paul Andrew “Andy” Mireles (B.A. ’72, J.D. ’75), and other family members. He came to St. Mary’s as an undergraduate because it was a place dear to his family. But it was what he learned and experienced while a student that made him want to come back as a faculty member. 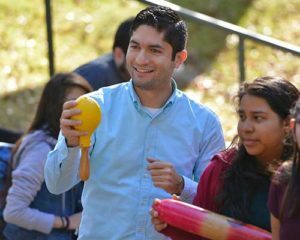 Many kinds of instruments, including maracas, were part of the outdoor class experience. Studying music with Mireles has been a motivating factor for trumpet player Brandon Guerrero, a senior Music major who hopes to one day become a band director. Mireles earned a Master of Music degree at the University of Alabama and a Doctor of Musical Arts degree from the University of Wisconsin-Madison. Along the way, Mireles won the gold medal in the Leonard Falcone International Euphonium and Tuba Festival competition, the premier tuba and euphonium competition in the world. As Director of Bands, Mireles conducts the Concert Band during practice. He has recorded two albums: Boreas Quartet, which won the Roger Bobo Award for Excellence in Recording from the International Tuba Euphonium Association, and Prometheus, which he recorded while pursuing his doctorate. Mireles explained that his success would not have been possible without the people who helped him along the way — many of those at St. Mary’s. As a professor, Mireles’ goal is to return the favor, pushing his students to be better musicians, people, educators and, ultimately, better citizens.